The BB&T blind is named for the team of hunters who designed it -' Brock, Berry and Tatem. The unique blind was dedicated to the waterfowl hunter on the team who lost his life hunting the nearby waters and never saw the blind's completion, Tommy Brock. North Carolina waterfowlers Earnest Berry and Paul Tatem built a luxury duck blind to honor their fallen hunting comrade, Tommy Brock. The BB&T blind was built at the confluence of Chappel Creek and the Perquimans River in Northeastern North Carolina, on a point of land in a dense cypress and gum swamp, just downstream from spot in Chappel Creek where Brock lost his life on Oct. 8, 2009. "The 2009 duck hunting season started a little different for me and Tommy Brock, who was an avid duck hunter for 35 years," Paul Tatem said. "He kindled a fire in me for duck hunting and rekindled a fire for duck hunting in my good friend, Ernest Berry. This was not unusual for Tommy, as he considered sharing his love of duck hunting with new duck hunters, as well as his son, Shawn, a privilege." The 2009 season began with Tatem taking his first wood duck. Berry and Brock visited favorite spots and other places where they planned hunts for the upcoming 2009-2010 hunting season. One of the new spots they found was already owned by Berry. They began drawing up plans to build a blind, and thought it would be a good idea to enter it in the Wildfowl Boats and Blinds contest. "They spent hours designing the blind, which included all the comforts of home," Tatem said. "Once they showed it to me, I thought they were out of their minds. But being young in the duck-hunting world, I was a sucker for anything. Then, in matter of weeks, tragedy struck as Ernest and Tommy were duck hunting out of a canoe." After the hunters killed a wood duck, their canoe capsized. Both men made it to shore. Brock was the stronger swimmer, so he went back into the water to retrieve the canoe. The experienced swimmer reached the canoe, but went under and did not resurface. Berry ran through the swamps looking for help. Four hours later, the Perquimans Underwater Search and Rescue Squad found the drowned duck hunter. It was later determined he had suffered a heart attack, which caused him to drown. "After taking our time to grieve for Tommy, it became imperative upon me, Ernest and his son, Troy Berry, as well as Mrs. Brock and Tommy's son, Jason, that we complete the planned duck blind, which we would name BB&T for Brock, Berry, and Tatem. Mrs. Brock had thought of the name weeks before Tommy's death." Berry took measurements at the blind site so the blind would fit between the trees and atop the limited swampy soils, and then began pre-construction at his home. The blind's sections and pieces would be assembled later after they were ferried to the site. Weather delayed construction several times. But finally, on Dec. 2, 2009, transportation of the floor sections to the blind site started the assembly. In a single day, the support posts and floor were assembled. Jason Brock, Tommy's youngest son, took the photos and helped build the blind. Berry took Jason Brock to visit the place where his father had drowned, which helped him through his grief. The second and third days were spent erecting the pre-fabricated walls and roof. On the fourth and fifth day of construction, the crew brushed the blind and added a propane heater, benches, and a cooking stove. The blind was primarily built of wood from a tree on Berry's property, cut on a portable sawmill at a cost of 25 cents per board foot, saving $5,500. Total cost for the lumber was $560, including the use of treated wood for structural areas and plywood for benches and roof. The men used a tobacco-barn style of construction, with the wall planks running vertically rather than horizontally. The cracks between the planks are covered with narrow strips of wood. The floor was built in three sections. Two sections measured 8 feet by 6 feet, while the other is 4 feet by 12 feet. The floor joists are 2-inch-by-4-inch lumber set on 24-inch centers with 2-inch-by-6-inch headers along the ends of each section for stability. Support posts were 4-inch-by-4-inch lumber. The completed floor footprint is 12 feet by 12 feet. The sides rise from the floor 40 inches, and then angle inward and upward. These angled wall sections are 18 inches front to back. A mid-wall runs from the back of the blind to a distance of 8 feet and supports a roof. The 11-foot-long roof is gabled, extending 40 inches on either side of the mid-wall. Height from the floor decking to the roof peak is 7 feet. Hunters enter the blind from a door in the rear and can walk around the mid-wall at the front of the blind to the other side. The BB&T duck blind, with amenities such as a cook stove, propane heater and battery-powered lights, is far beyond an ordinary duck blind. The duck blind has three wooden benches. The front bench is 18 inches wide by 6 feet long. The side benches, located back to back along the mid-wall, are 24 inches wide by 8 feet long. The front bench attaches to the ends of the two side benches. The benches are made of plywood and are boxed in around the bases. The tops are hinged for access to the compartments. Metal swing gates cover vent holes in the bench lids and sides to allow gear inside to dry. Two 25,000-btu propane heaters are located along the front wall, and an RV cooking stove/oven is positioned in the rear corner. Another 30,000-btu propane heater set at the rear of the blind inside the bench seat nearest the cooking stove delivers forced hot air. Slats nailed to the vertical strips along the outside of the blind create brush holders in the gaps left between the strips. Notches in boards set along the top of the blind's sides create gun racks. The notched boards are also angled toward the outside of the blind and attached to backboards, creating a continuous shell and gear trough all along the edge of the blind behind the gun barrel notches. The completed duck blind allows shooting from three sides. A three-rung aluminum stepladder allows access from the ground level to the blind. 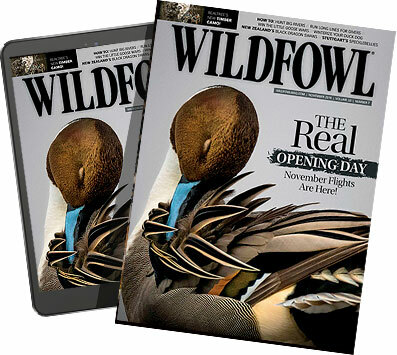 "It is my wish that all Wildfowl readers use caution while boating," Tatem said. "Ernest and I have learned this lesson by losing a good hunting partner and fellow brother in Christ. We have strict rules about wearing a life jacket in the boat. Life jackets are like seat belts in cars. They don't do any good unless they are being used. "Ernest and myself will have years of fun using our duck blind and carrying on the tradition of sharing our passion for duck hunting as Tommy Brock did with me."